Update: The Numenera Bundle of Holding has been expanded with four more titles. Pay over the threshold price of $20.05, and you will receive Gen Con 2013 Numenera launch adventure Vortex, a wide variety of new item and technologies in the Cypher Collection 1 and Artifacts and Oddities Collection 1, and In Strange Aeons, a guidebook of advice for GMs to incorporate Lovecraftian horror into Numenera games. Monte Cook's science fantasy RPG Numenera is featured in this week's Bundle of Holding, including The Devil's Spine adventure. 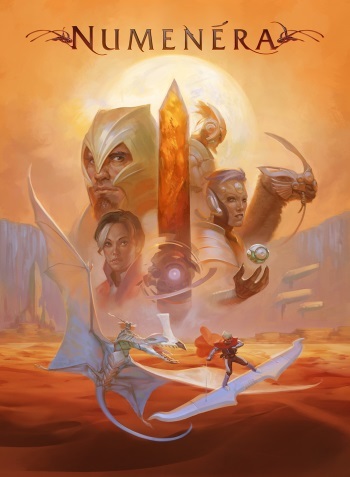 The Numenera RPG from Monte Cook Games gets some science in its fantasy, exploring a far future where players discover leftover bits of technology from past civilizations, battle bioengineered monsters, and unearth forgotten artifacts. The game emphasizes narrative storytelling, with streamlined rules so players can focus on exploration. Pay $9.95 and you'll receive the core Numenera rulebook, which includes everything you need to play Numenera, and a GM screen. The standalone rulebook comes with a complete overview of the Ninth World setting, a bestiary, hundreds of items, and four adventures. Pay over the threshold price ($18.77 at the time of writing) and you'll receive three bonus titles. The collection of DRM-free PDFs is available until 11 am ET on May 23. The three bonus titles add resources for players and expand the world of Numenera with more creatures, items, and adventures. The Ninth World Bestiary brings more than 130 creatures and advice on creating custom monsters. The Numenera Player's Guide is a 64-page resource for new players, streamlined to get you up to speed and playing Numenera. The Devil's Spine is a framing story with three adventures, which can be run as a campaign or used individually. The adventures also include new characters, items, and creatures that can be used in any campaign. Like other Bundles of Holding, ten percent of all purchases go to charity. Monte Cook Games has chosen to split the donations between Human Rights Watch and Women's Learning Partnership. And, as always, the PDFs included in the Bundle of Holding are completely DRM-free, so you can freely store them on all your devices. Award-winning designer Monte Cook is well loved by RPG fans and best known for his work on Dungeons & Dragons 3rd Edition. Cook has been designing games and writing adventures since 1988, and has worked on D20 projects like Call of the Cthulu and Arcana Unearthed. He returned to Wizards of the Coast to work on D&D Next, but left in 2012 over a difference of opinion. Later that year, Cook launched a Kickstarter for his Numenera RPG. The Kickstarter raised $517,255 from 4,586 backers, a staggering 2586% of its $20,000 goal.